When writing a dictionary definition of a new word, the authors work exceptionally hard to make sure that it is as succinct and specific as possible. They work to create a definition that only calls to mind that word. While synonyms are often referenced, they’re not used as the basis of the definition. After all, it’s not very useful to look up the noun “can” and only see the word “container”. Is a can a container? Yes, but so is a carton. What’s the difference? You see where I’m going with this, I’m sure. A mission statement should define your business in a similar way. It should be as succinct and as specific as possible, so that you can reference it at a moment’s notice when making key decisions. I was once peripherally attached to a deal in which a major portion of an international corporation was being offered for sale through back channels (nothing illegal, just very hush-hush at the time). In shopping the deal around, I was able to speak to the Chief Executive Officer of a large, well-established firm. I initially thought he would have a keen interest. I gave him a very brief synopsis – the so-called “elevator speech”. He instantly replied, “That’s not what we do,” and he laid out for me his firm’s prime directive. In one sentence he detailed how his firm, a major player in their industry, made their money. The conversation was over and rightly so. It was a wonderful lesson about the power of a well-defined mission statement. It was like sighting the North Star on a clear, moonless night. This CEO was famous for having steered his company through some of the most explosive growth his industry had ever seen. When he took a pass on the deal, there was no doubt in my mind he was doing the right thing. How long should a mission statement be? One paragraph, in my view. Short enough to memorize but long enough to include the specifics of how your business makes money. It should be unambiguous, positive, active and unconditional. Use language such as “We will do…” rather than “We will try…”. Don’t use negative statements like “We won’t…” unless there’s a very specific reason to distance yourself from an industry stigma. For instance, if one way you make money is to operate through a dealer channel it may be necessary to specifically dispel any notion of multi-level marketing, an unsavory term in many business circles. Don’t base your mission statement on your competition, as in “Acme, Inc. will be a bigger department store than Macy’s.” Instead, differentiate yourself without referencing them. “Acme, Inc. will be the leading department store by gross retail sales in the world.” This automatically means that you’ll be bigger than Macy’s – and anyone else who comes along. 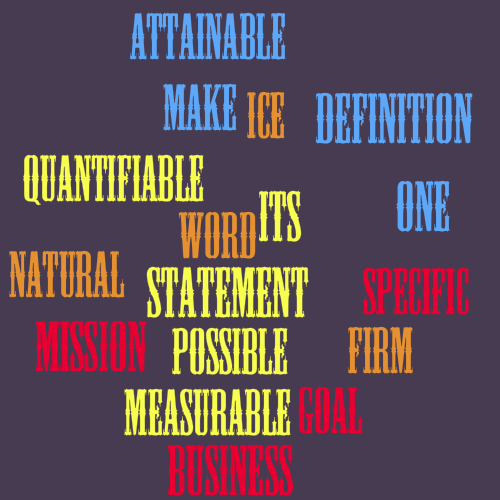 Your mission statement should outline quantifiable, measurable and attainable goals. It may or may not be appropriate to include specific numbers in your goals. A goal stating, “To become the leading provider of professional training for actors in the United States,” is quantifiable through sales, measurable against your competitors and attainable given enough sweat equity. A less grandiose but equally useful goal might be stated, “To fill four 13-week classes with 25 actors each per year.” A not-so-useful goal would be “To become the most beloved acting teacher in the world!” because it’s not quantifiable (What benchmark and data would you use? ), not measurable (What unit and scale would you use?) and certainly not attainable (How would you know you’d attained it?). However, it’s amazing how often you’ll read ambiguous phrasing in corporate mission statements. “To become an incomparable provider of insurance products” sounds good but doesn’t really tell us anything about the company or its goals. To maintain our position as one of the top x leading manufacturers by gross sales of ice cream and other dessert products in the United States while using the highest quality, all natural ingredients available. The second one references quantifiable, measurable and attainable goals. The first one, not so much. What’s a euphoric concoction? To many people it would be a martini. Which brings me to my next point: clarity. While it’s fun to use such whimsical wording, you need something to share with your lawyer, accountant, marketer, etc. that will instantly put them all on the same page, in which “euphoric concoctions” is specified as “baked confections”, or some such. Finally, there’s a difference between a mission statement and a values statement. A mission statement is a plan of action. A values statement outlines a code of conduct. Ben & Jerry’s statement “To make, distribute and sell the finest quality all natural ice cream” is a clear call to action, but their commitment to promote “business practices that respect the Earth and the Environment” is much more about how they intend to behave in the world rather than how they will generate revenue. Your mission statement acts as a dictionary definition of your business. As much as possible, it should call to mind your business and only your business, and give you a star to steer it by. If you’re having trouble crafting a mission statement, feel free to reach out to me and we’ll craft it together. Previous What Makes Content Compelling? Next How Can a Simple Content Marketing Plan Work For You?